I think I’ve mentioned this before, but I absolutely LOVE oatmeal raisin cookies. Especially nice and chewy ones loaded with raisins. So when I was thinking about what I could bake they came to mind immediately. 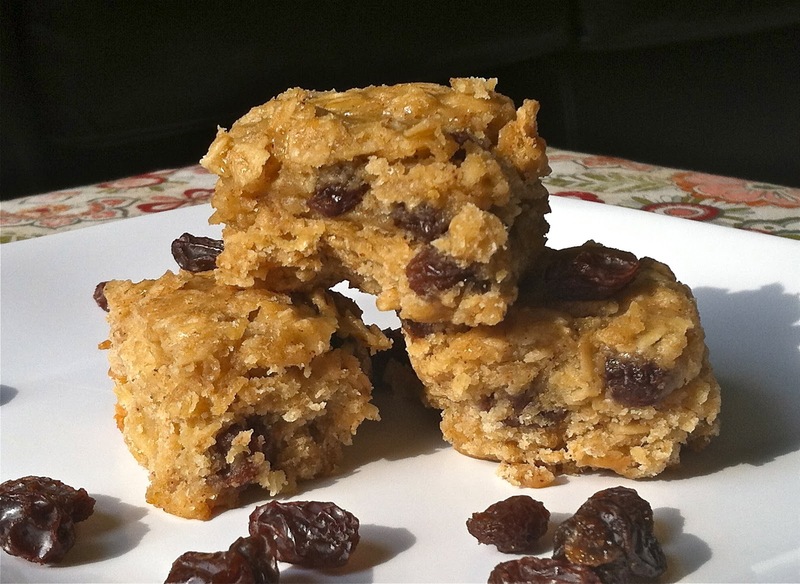 Then I had a brilliant idea to try and make them into bars… well I thought I was brilliant until I googled “Oatmeal Raisin Bars” and about a million results popped up! Oh well, why reinvent the wheel, right? So I picked one of the first recipes for them that I came across, which happened to be from the one and only Martha Stewart. I did change Martha’s recipe a bit, in order to cut back on the butter. Her recipe called for 1 1/2 sticks! So, I replaced some of it with unsweetened applesauce and I was pretty pleased with the results. The bars were just as good…dare I say better than oatmeal raisin cookies?! I loved how darn easy they were and mess free too since all you have to do is dump the batter in a pan instead of plop out individual cookies. This is a great recipe when you are in a hurry and don’t have a ton of prep time. 1. Preheat oven to 350 degrees and line an 8-inch square baking pan with foil. 2. In a large bowl, whisk together butter, sugars, egg, salt, and cinnamon until smooth. 3. Add flour, oats, and raisins; fold in just until combined. 4. Spread batter in prepared pan, and bake 30-35 minutes. 6. Using paper overhang, lift onto a work surface; cut into 16 bars.